We try to offer a little bit of everything, to be a small wine shop in a grocery store. To have everything from Kendall-Jackson and Veuve Clicquot to small vineyards in California. We like supporting sustainable wine growers and we try to call those out with different signs. But we don't limit our selections to just those wines. We also try to give a food pairing on the signs. We are a grocery store. It plays into everything that we do. It's definitely a factor: not just a selling point, but in line with the philosophy of our company. Ultimately the main factor is quality and price for quality. How do you parse the many definitions of sustainable? To me, if a winery is making an effort to be sustainable that's a step in the right direction. I know there are a few different agencies that look into certifying sustainability. I don't have a lot of information on that, but I definitely would support that. If we could get a seal of approval, that definitely would help. It's just like there's no definition of all-natural. With wine, we do allow added sulfites, but we don't carry sangrias that have added flavors. With our larger promotions we find out more about the wineries to find out what their practices are. Some of the larger wineries have wind power or they buy carbon offsets. Are customers looking for wines with no sulfites? There are definitely customers who that is very important to. We do offer wines with no added sulfites. That would be less than 20% of our customers. But for some people, no added sulfites is important. Then there are foodies who are looking for something new and exciting and something they haven't tried before. And a third set of customers are looking for value and quality. That's why we offer products like Three Wishes, that is $2.49 a bottle. Have people bought Three Wishes who might have bought more expensive wines? In some cases, but our concern was that some customers would be going to Trader Joe's. Trader Joe's was the first to do it but now most large chains have a $2 or $3 wine. For a long time we didn't carry one because we didn't think that's what our customers were looking for. More than cannibalizing sales, for us, that market already existed outside of Whole Foods. We may have gained some customers. Our data doesn't suggest we downtraded customers. Some customers may have traded from $4 or $5 wines but they weren't buying $10 and over wines. We definitely did not see a loss of over $10 wines. And we saw a growth in over $25 wines. That's been going on for over a year. How is the Northern California customer base different from other parts of the country? I think our customers are most similar to New York area customers. A lot of our customers travel internationally. They've experienced wines or cheeses from other countries. There's a lot of interest for smaller production items that typically would only be found overseas. And the whole local thing. In Texas, most consumers would consider "local" to be anything from Texas. Here, most people consider "local" to be in the same county. From Napa and Sonoma, both wines would be local to them, but they like supporting uber-local, what's right in their backyard. I can't think of anywhere in the country that has such a small definition of what "local" is. What do you see as trends for the rest of 2013? I'm not seeing any drastic changes right now. Sauvignon Blanc is continuing to grow at a fast pace, especially domestic Sauvignon Blanc. Surprisingly, French wines are continuing to decline in sales. But I don't see anything in double-digit growth or decline right now. Growing up in Austin, Whole Foods was a big deal. Shortly after college, I attended my first wine tasting at a Whole Foods in Austin...and dressed up tremendously (as I thought befit the occasion). Not only was I the only one wearing a white dress shirt and a tie, but I managed to spill wine all over my outfit. Fortunately for me, everyone at Whole Foods made me feel like I wasn't looking and acting the fool, and I had a great time. Not sure I would have followed a career path in the wine business if that exprience had gone differently. I've spent a large percentage of my wine career with Whole Foods alongside as a terrific partner. They continue to raise the bar with their selection and provide awesome knowledge to their customers on the floor too. Staff training and education is important to them, which is thrilling to know that wines are handled with TLC and not just left on shelves to collect the dreaded grocery store dust. Kudos to them for making their departments a friendly place to shop for wine to all. It's always a pleasure to work together, they are making a difference for independent and family owned wineries each day. Refreshing! Jeff: I never considered the issue before, but it does seem like added alcohol would be a good replacement for sulfites in preserving wine. Which begs a question I don't know the answer to: Are there sulfites in Port? Anybody know? BTW a note to folks reading this: Ordinarily I don't allow sales pitches in the comments, but I'm letting this one slide because the technical point is interesting. Let's not make it a trend. I shop at Whole Foods at least once a week and always check their wine department. I have tried a several of their wine specials (Top Notch Wines at Easy to Swallow Prices) and its about 50-50 that they are really delicious. Overall their wine prices are higher than I find at the Burlingame Safeway and Costco. The Burlingame Safeway has the usual “crap” that you mention but many from small producers. I found the Il Gioiello Zin from Fiddletown in the Sierra Foothills there and it is fantastic at $8.09 when you buy six. I know for a fact that the Safeway varies its offering by demographics. On the Peninsula the Burlingame, Menlo Park, and Sequoia Station Safeway have a huge wine department. I am always dismayed by the Whole Foods wine dept. They have an Eco Friendly section with "sustainable" and cheap organically grown wines. Then they put the better organically grown wines out in the varietal categories with NO LABELING highlighting these organically grown wines. THEN THEY ALSO have great organically grown French, German and Austrian wines that are also not called out. But mostly, I don't like how much they pander to cheap European imports. Or that they don't have an organic version of their $2.49 house brand. Trader Joe's has $4 house labeled organically grown wines from California; and then there's always Green Fin (another $4 California organic - from Bronco). Why doesn't Whole Foods STOP putting "organic" with "sustainable"? And start offering local, cheapo organically grown wines. I am tired of seeing big displays (paid for by French) of Bordeaux or some other giant wine region in Europe in the Oakland store. This question betrays my ignorance about the wine industry, so please be nice to me! I'm wondering how Whole Foods is able to offer a $3 bottle of wine (Three Wishes). Recently, I noticed they also have a $4 offering (Don Simon Seleccion). Are these wines rebranded versions of other stuff that's already on the market? Do these wines differ in a marked way with wines costing $6-8? Is the fermentation process different? Are the grapes different? What goes into making such a (relatively) inexpensive bottle of wine? What are you "really" getting when you buy Three Wishes compared to most of the other wines on the shelf at Whole Foods, or any other retailer, for that matter? Thanks! Hi Aaron, for a guy who claims ignorance you ask some very good questions. These wines are made cheaply because they are mass-farmed and machine harvested with as little human touch as possible, because labor is -- next to land cost -- the biggest expense in grape farming. Speaking of land cost, these wines come from regions that are reliably warm, and are made from types of grapevines that produce a lot of grapes. Your most interesting question is, do they differ in a marked way from wines costing $6-$8? Perhaps they do in the quality of the grapes. But in many cases they do not. If you spend $12 or more on a bottle of wine, you should (not necessarily will) get a better bottle of wine than Three Wishes. I'm not sure you can guarantee that at $7. You're paying for a lot more brand marketing at the $7 level. So far as I know, Three Wishes and Charles Shaw do no real brand marketing at all. Personally I like wines in the $15 range; with those you can hope to get human touch and human oversight. 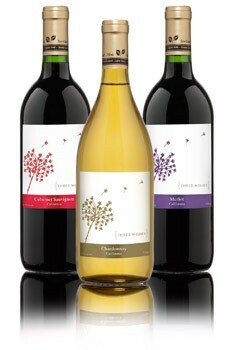 The Three Wishes wines are factory wines by necessity. That doesn't mean they're bad, though. Good questions. Bring 'em on. And great answers, thank you! AND you were really, really nice (praised the quality of my questions). So I got everything I asked for. I like this blog! Really, I do appreciate the kind response and the helpful answers! I asked that series of questions about Three Wishes and its ilk because indeed, I have tried them and indeed, I have inquired about them before (not here, obviously). I've received the following answers thus far as explanations for their retail price: "they're loss leaders" - "the glass bottle is super thin - less weight - transport costs lower and bottles cost less to begin with" - "the wine making process uses a lot of added sugar and grape quality is very poor." I did not consider any of these answers satisfactory, so when I happened upon your post, I was eager to ask for another perspective. Makes sense to me what you shared about mechanizing the processes / reducing labor costs. But, do any of the other explanations I've heard have any credence whatsoever? Thanks again! Aaron: The answers are not mutually exclusive. I don't know if these wines are loss leaders per se. Fred Franzia makes a profit on Charles Shaw or he wouldn't do it. That said, the profit is much smaller on these wines, so they do work like loss leaders. But the don't cost more than the retail price to produce, no. The super-thin glass bottle part is true; there are other examples of materials cost savings, such as cheaper labels and ink. It all adds up. A lot of added sugar to the winemaking -- I don't think that's true. Most of the grapes are from the San Joaquin Valley and ripeness is not a problem there. Grape quality is poor: well, if they could put these wines in $15 bottles, they would. But that gets back to your question about Three Wishes vs. a $7 bottle.